The cloud practice-based research methodology is a network for researchers and practitioners who want to exchange and create knowledge about research methods in practice-based research. The provisional aim of the cloud is to identify possibilities and issues concerning the relevance, the rigor and the ethics of doing practice-based research. The cloud coordinators Niek van den Berg and Marco Mazereeuw would like to further elaborate this goal with colleagues. 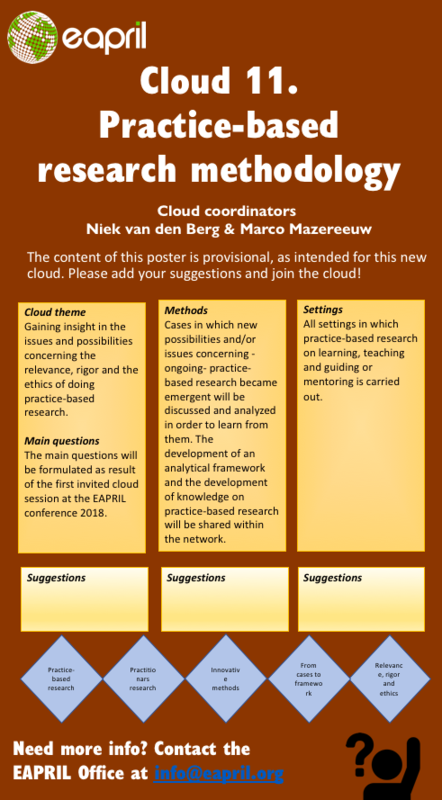 At the upcoming EAPRIL conference an invited session of the cloud will be organized in which we get acquainted and learn from the first cases. We will also supplement the aim and the poster of the cloud together. As a result, an updated cloud mission statement will follow by the end of 2018. Please be invited to join us at EAPRIL2018.